Are you tired of the usual dishes of pasta or rice? Don’t worry, there are plenty of different types of cereals that allow your dishes with carbohydrates to change shape and consistency. Today we take you on a journey around the diverse existing cereals and used in the kitchen all over the world. Maybe they are pretty unknown in Italy, but they are tasty and versatile, to try to cook with them to create new and tasty recipes. Typical and spread in the turkish cuisine; it is a kind of whole wheat carried out since the babylon: bulgur is made with grains of whole grain steamed and then dried, once dried they are grinded roughly in small pieces. The size of the pieces can be big (2-4 mm) or small and it is perfect for the different preparations: bulgur in big pieces is perfect in broth or soups, the small version instead is perfect in cold dishes like salad and single dishes. It is rich in complex carbohydrates, but also proteins, magnesia, phosphorus and poor of fats. It is easy to prepare, generally as it is pre-cooked, it is sufficient to cook it like couscous, it means rehydrating it with hot and salty water. Tubuleh is a cold recipe typical of Middle East, fresh and tasty. After rehydrating the bulgur in hot salted water, mix it with red belt pepper, onion, tomatoes and cucumber cut in small pieces. Sprinkle with a drizzle of oil, lemon juice and sear with salt, pepper, parsley and fresh mint. 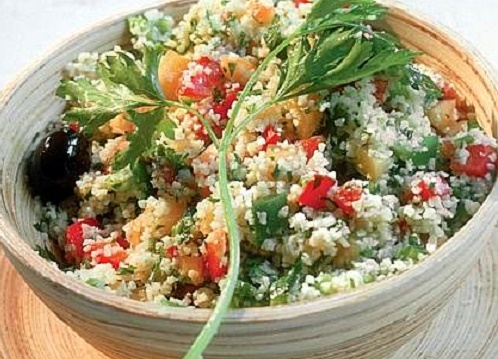 Cous cous consists in small conglomerate of semola steamed and used in sweet and salted preparation. The starting ingredient to make small grains of cous cous is the durum wheat semola grinded roughly. Semola is wet with water and knead until it becomes small balls of semola. Couscous is dried till it lost all its humidity. It is the basic ingredient of the cuisine of the countries of North Africa, pretty spread in Morocco, Algeria, Tunisia where it is ate together with vegetables cooked together with spiced broth, with lamb meat or beef and dried fruit but also with spices and fruit. You can buy pre-cooked couscous in the supermarket and it is perfect for lots of preparations, in its Italian version “alla Trapanese” it is delicious. 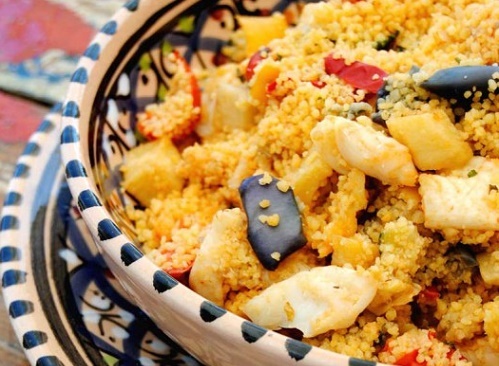 Couscous of Trapani is a dish of fish rich and tasty with different types of fish like rockfish, stone bass, dory, spring chicken but also squid, mussel, prawns. It is a cereal typical of middle eastern part of Asia and the Middle East. But in the recent years it has become popular also in the Italian and European tables. The main benefit of this cereal is that it is gluten free and thus it is suitable for the diet of who is suffer from this kind of intolerance . Millet has to be cooked in the water for a long period of time; it is rich in amid but also vitamins, phosphorus, potassium and magnesia. It is easy to digest and with few calories. Millet is a cereal easy to prepare and to cook. A single dish that combine together taste and the right charge of energy. 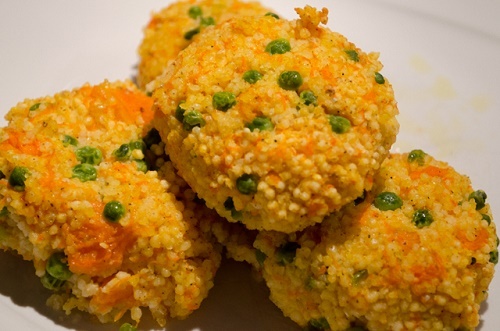 To prepare the millet meatballs it is necessary to boil 150g of millet as written in the pack (usually 45′) and cook in a pan mixed vegetables: dice spring onion, courgettes, beans, potatoes, carrots, broccoli, belt pepper. Mix the vegetables with millet, add a spoon of parmigiano, an egg and breadcrumbs. Make some meatballs and cook in a pan.